That’s the first part of the statement you see if you choose to read the lengthy legal speak for Amendment, we’ve explained the need for Amendment 73 and funding issues here, here, and here. 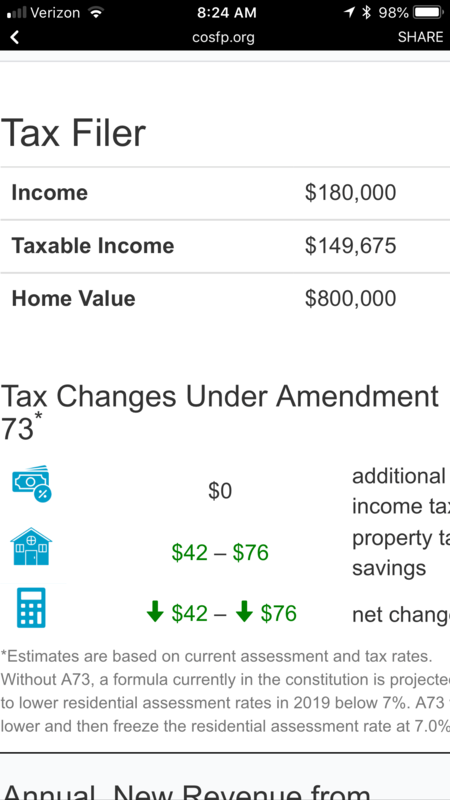 But, what if we could put a calculator in your hands to show you exactly how Amendment 73 could impact you?! Well, our friends at the Colorado School Finance Project and the campaign have done that! Click this link to see the calculator and enter your information. It doesn’t store your information or anything like that, it uses codes and tables in the background to check your jurisdiction, salary, and property value to show you what you’d pay and what you’d save. As you might imagine, we’re a little obsessed with this handy tool and we think you’ll appreciate it too! We’ve been playing with it, changing salaries and property values, to test the impacts. 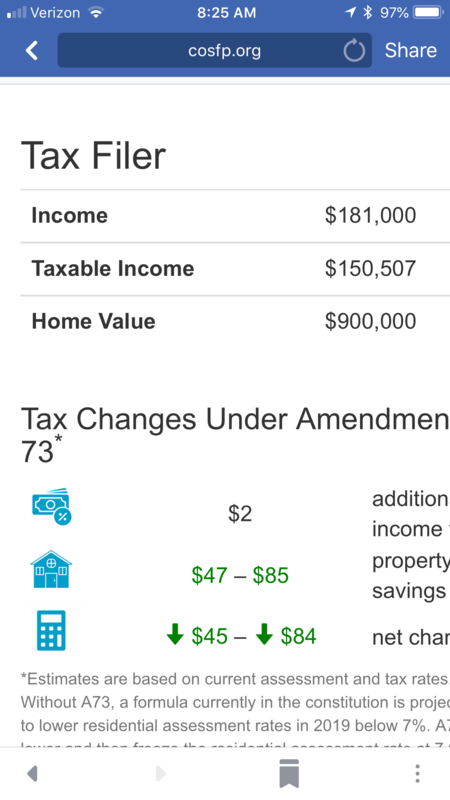 As you can see below, with a salary of $170,000 and property value of $500,000, there are ZERO tax impacts and the property tax is actually reduced. 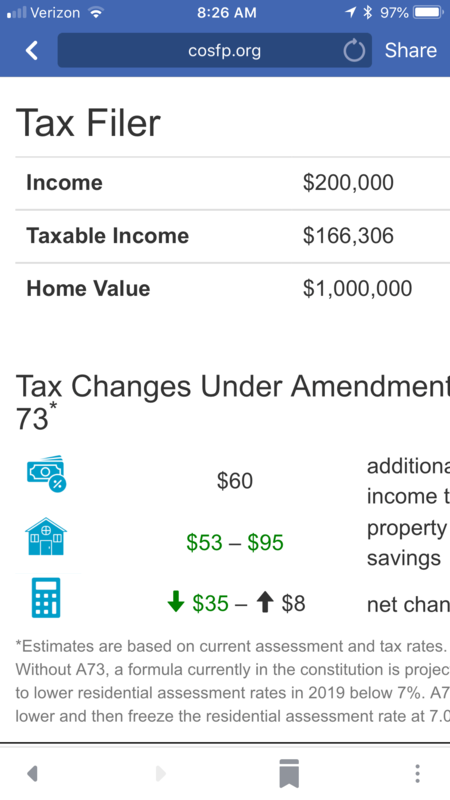 For a salary of $180,000 and property value of $800,000 there are zero tax impacts and still a property tax reduction. Not until we reached a salary of $181,000 per year and property value of $900,000 did we see a tax impact. Still, for $2 per year and a property tax reduction, this Jeffco resident would still have a net reduction. At $200,000 per year salary and property value of $1,000,000, the net impact is between a cost of $8 or a reduction of $35. Do you make $200,000 a year and own a home worth $1,000,0000? 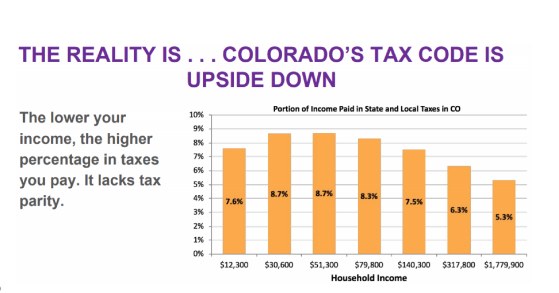 If so, you pay fewer taxes than more than 92% of people in the entire State of Colorado. 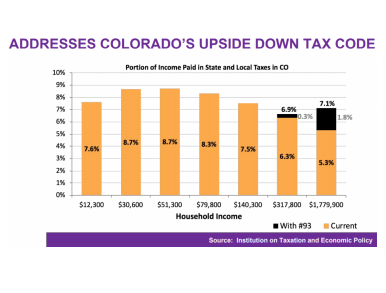 Amendment 73 addresses Colorado’s upside down tax code, which the Colorado Fiscal Institute has been educating people about for years! 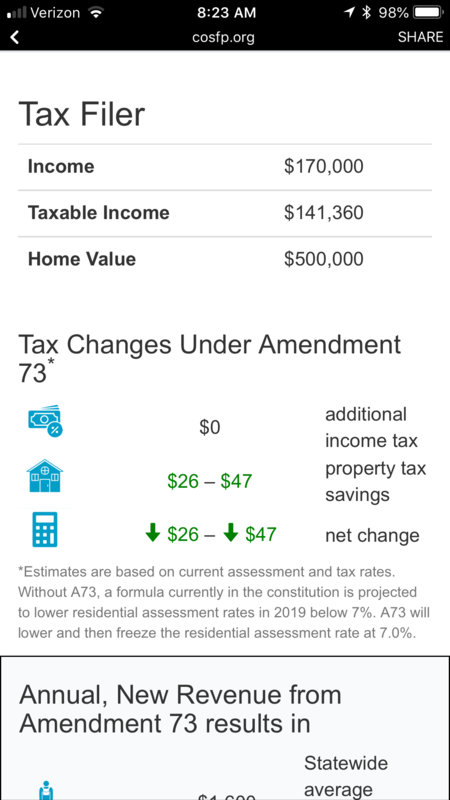 Play with the calculator and share with your friends so people can really see how Amendment 73 addresses funding education for more than 900,000 children. Bringing much needed relief to all 178 school districts. Our children are a very worthy investment!